There has been something of an uptick in the number of science fiction time travel books for younger readers in the past few years--books in which high tech gizmos send folks zwooshing around through the centuries, and in which good guys want to protect time time, and bad guys want to alter it, and the kids end up trying to make things right (the Lost series, by Margaret Peterson Haddix, the Infinity Ring series from Scholastic, Richard Ungar's Time Snatched and Time Trapped, and more). There have also been many many many speculative fiction books for kids and teens set in special schools. 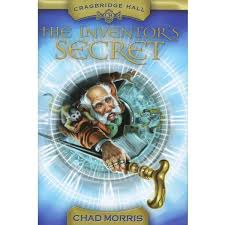 The Inventor's Secret (book one of the Cragbridge Hall series), by Chad Morris (Shadow Mountain, 2013), combines these two trends. A little ways into the future, twins Abby and Derick Cragbridge are tremendously excited to be enrolling at the school their grandfather founded--the only one in the world where the high tech gizmos he invented allow students to actually perceive history as it happened. It's not true time travel--though the technology exists to make that possible--but it's darned close. Life at the new school is not all roses, though--only the best and brightest get to go to Cragbridge Hall--and Abby just plain isn't, so she comes in for a lot of flack from other students. However, that issue quickly becomes irrelevant when the twins' grandfather and parents are kidnapped by a man who wants to take control of time for himself. Oscar Cragbridge, worried that this might happen, left clues that will allow those he trusts to take control of time, if necessary...and so Abby and Derick set off to unravel them. If you have a reader who really loves nifty school stories, this might well be a good pick--there are other fun inventions in the school, and interesting bits of school life (the animal avatars in particular have lots of kid appeal). The pace is fast, the premise interesting, so it's not surprising that there are lots of good reviews on Amazon. And it's a nice bonus that ordinary Abby is the one to truly save the day. I myself, however, had to make a conscious effort not to think to hard about the time travel technology (I'm not at all clear, for instance, how the bad guy got the parents back to the Titanic, and the paradoxs of the whole thing (if people are stuck in the past, is time passing in the present really an issue? ), but it was hard not to listen to the cracking of thin ice as I skated along. These difficulties (which could be less pronounced for other more slow and careful readers) combined with the fact that one of the supporting characters was as annoying as heck, from personally enjoying this one. I think you mean Cragbridge Hall.